Five Little Monkeys Swinging in a Tree...the story. 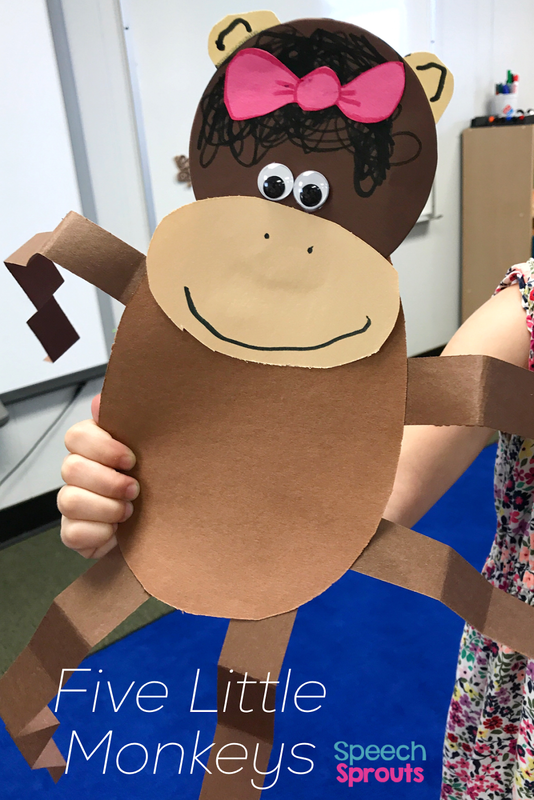 My preschoolers love those naughty little monkeys who boast: "You can't catch me!" So do you think you can capture the attention of a group of preschoolers for the second day of Five Little Monkeys Pre-K speech therapy? Oh yeah. You bet. 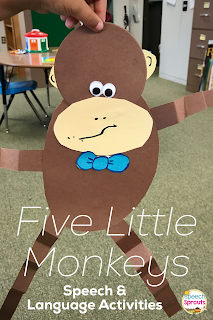 We talked about Five Little Monkeys Jumping on the Bed in my last post and I shared a cute FREE little monkey dot marker activity. (free download for subscribers!) Be sure to take a peek. We had lots of fun, and my sweeties were definitely up for more. Day two was all about Five Little Monkeys Swinging in the Tree. Of course, we started off by reading the adorable story by Eileen Christelow. Repetitive stories like this are perfect to encourage children to participate. Do the fingerplay actions as you turn the pages, and your preschoolers will enthusiastically chant the rhyme along with you. 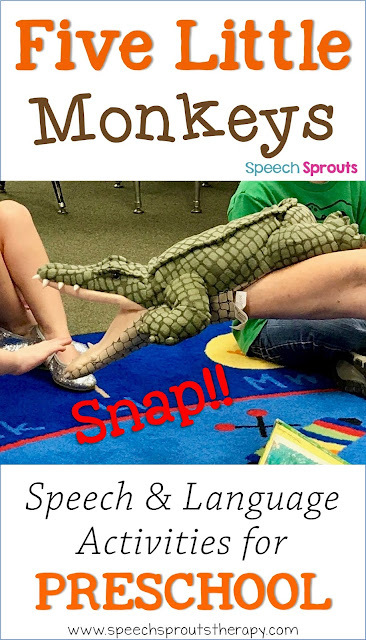 Each time the crocodile sneaks up another monkey we make "jaws" with our two hands, open wide and ...SNAP! One more little monkey missing. Oh no! On the upside, it's terrific practice for the /sn/ blend! 1. 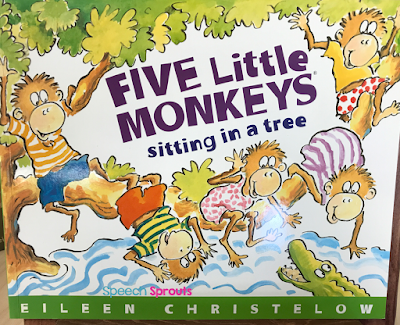 Five little monkeys swinging in a tree. 5. Repeat with four fingers and so on, until there are no monkeys left! This puppet gives me story-telling super powers! When I saw him on a trip to New Orleans, I knew I had to have him. Did I buy jewelry or a cute dress while there? Nope. I was drooling over the puppets in a little toy store. I'm pretty much always in the preschool frame of mind. Love, love my littles! While reading the story, this guy helps me turn pages, then gets ready to snap up some monkeys for dinner. 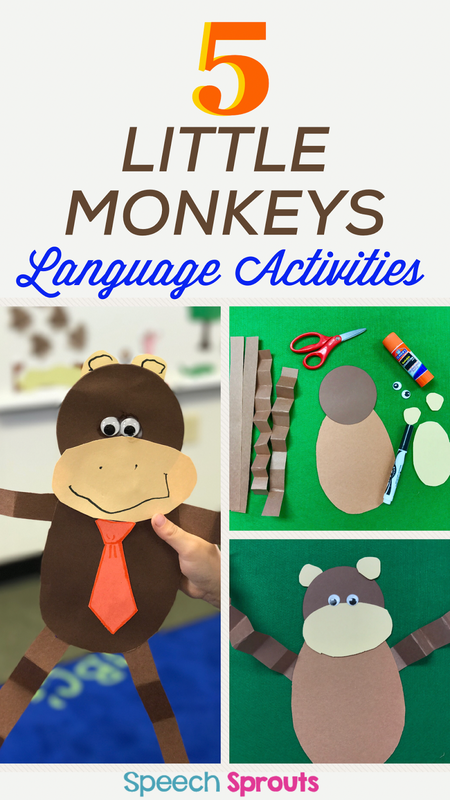 Five Little Monkeys activities my kids totally loved. We didn't stop there. We had to do a cute little craft, a fun game, and some send-home pages too! Make this easy Five Little Monkeys craft- simple and oh-so-cute! 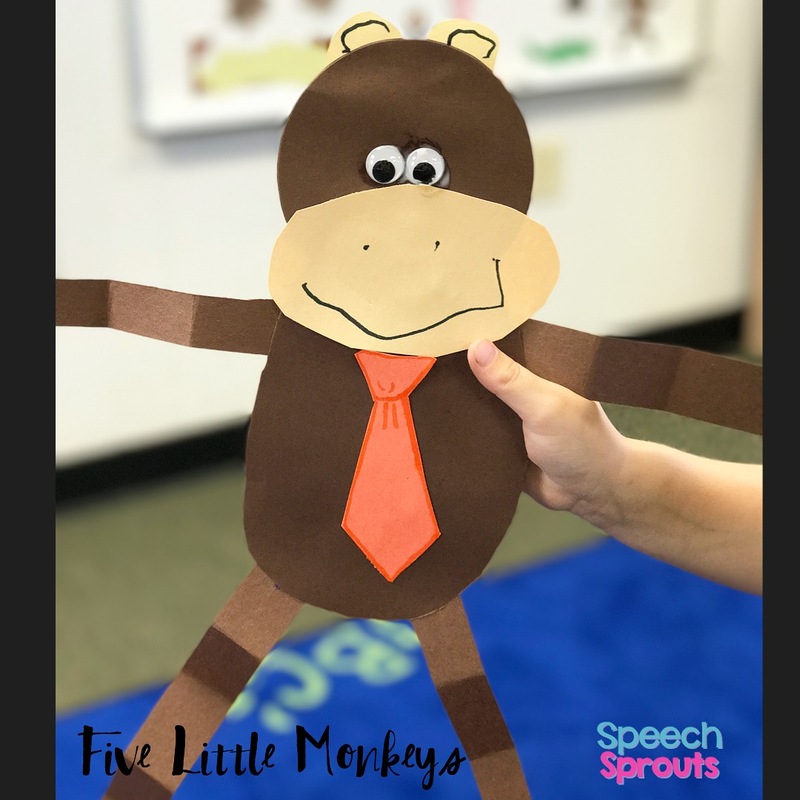 We made these adorable monkeys, and of course embedded plenty of language and articulation practice along the way: body parts, requesting, /st/ (We love to say "stick in on!" as we glue a piece.) We decorated with bows. bow-ties and business ties too. I love seeing how each child makes it their own. How do I fit in all these activities? 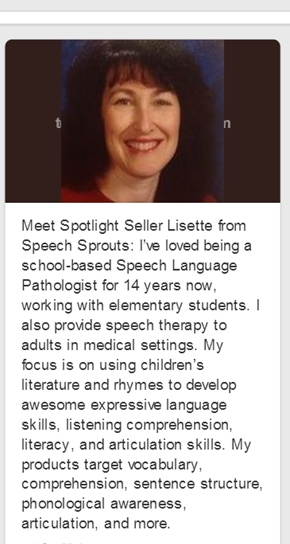 I have centers set up in my preschool therapy program, and our "art" center is one stop. 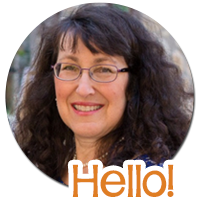 You may not use my delivery model, but if you do in-class therapy you could do each activity as a center, or simply use the activities over several sessions in a traditional pull-out setting. Boy, does that make planning easy! Plus the repetition is fantastic for comprehension, vocabulary acquisition, and story retelling. In our "activity" center, we played this fun game. Say your words and you get a monkey to put in the tree! 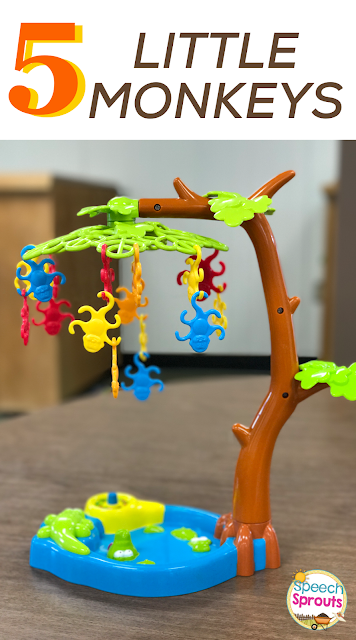 Be careful though, because the "tree top" is attached with a magnet and will fall if you don't balance those monkeys. And down below? There is a hungry crocodile of course! The perfect game to go with Five Little Monkeys Swinging in a Tree. I always like sending something home for carryover practice, so I created these activities. It's a freebie available in my Teachers pay teacher's store. This fun little collection of 6 activities (color by number, mystery squares, friendly faces and more) coordinates with my Mixed Group Magic and Quick List sets. What that means is that there is a box on each activity where you can paste a custom list for each child, whether it's s-blends, initial /m/, wh questions or other goals. Head over and download this Freebie for yourself and pretty please leave me feedback in my store when you do. I really appreciate it! 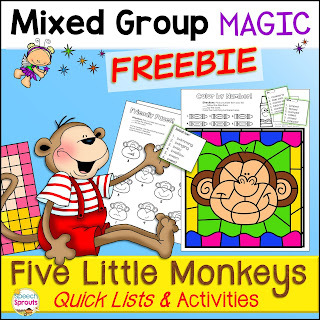 Find this freebie here: Five Little Monkeys Quick List Activities. If you haven't grabbed my Five Little Monkeys Dot Marker Activity in my last post, you will want to head there too. It's free when you sign up as a subscriber! 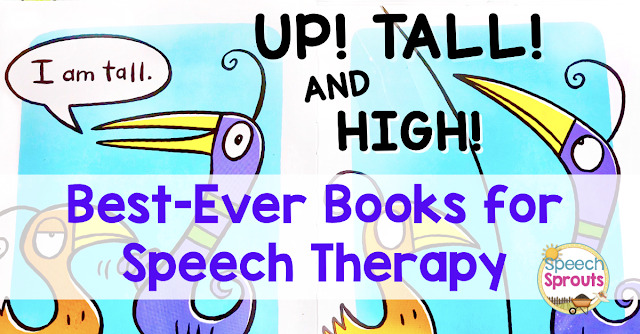 Click here to read the post: Best-Ever Books for Preschool Speech Therapy: Five Little Monkeys Jumping on the Bed. Don't you agree? I think this unit will keep your littles busy and learning for quite a while. 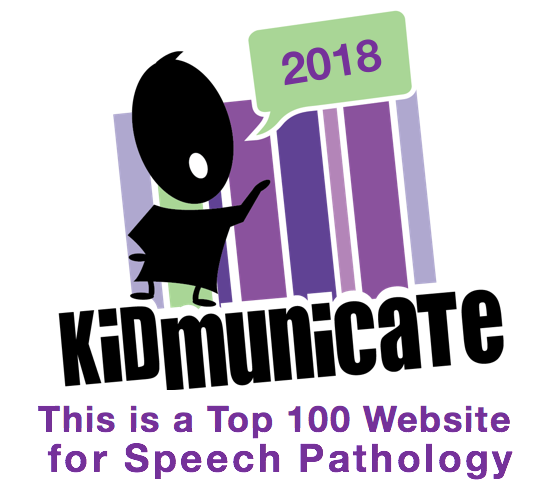 What are some of your favorite themes and storybooks? I'm always looking for new favorites, so leave a comment and share yours!